Curatorial Assistant Mary Coyne considers the politics and beauty of exploring the fourth dimension in Charles Atlas, Rashaun Mitchell, and Silas Riener’s Tesseract, a co-commission by the Walker Art Center and EMPAC (Experimental Media and Performing Art Center) that premiered at the Walker March 16–18, 2017 as part of Merce Cunningham: Common Time. Can formalism be a type of politic? I returned to this question while witnessing three performances of Tesseract, a collaboration between film artist Charles Atlas and choreographers Silas Riener and Rashaun Mitchell. Through an edited 3D film and live performance/live video component, Tesseract expands the limits of its media by adding additional dimensions: a film, typically two dimensions, becomes three, the live performance, usually three dimensions, becomes four. Tesseract is about geometry, or rather using geometry as a method for establishing an alternative futurism that exists in parallel to our current reality. In geometry, the tesseract is the four-dimensional analogue of the cube; the tesseract is to the cube as the cube is to the square. Just as the surface of the cube consists of six square faces, the hypersurface of the tesseract consists of eight cubical cells. In other words, the tesseract requires an assumption of four dimensions. I viewed Tesseract after conversing, as many of us have lately, about what type of work “should” be made, shown, and viewed right now and how art can be political simply by existing. Tesseract is political in the ways in which the best theories are, by creating and applying a methodology that offers an alternative to lived experience. During a visit to EMPAC in the fall of 2015, I witnessed a brief glimpse into one of these other worlds: a green screen, on which an immense set constructed of brightly painted triangular prisms that formed a type of façade, against which Silas and Rashaun constructed one section of choreography for the 3D film, Tesseract ▢. A small snippet into what would become the cohesive filmscape of Tesseract, the experience remained with me, much like the feeling of reading a page midway through a book before starting from the beginning: enticing but without scaffold. Nevertheless, that production still from memory—the work hatching in the tesseract-like structure of the Grimshaw-designed building in mist-covered Troy, New York—offered a key to the logic of the completed work. In Tesseract ▢ we are invited through a peep hole. The changing framing of the screen heightens this perception. We haven’t fallen through the looking glass, the viewers don’t ever quite enter the surrealistic words in which the dancers inhabit, but rather we have a sense that we are getting a sneak preview at the future—one that is at once dystopian and utopian, cold and austere even as it is bright and glimmers with a lack of pain or loss. Following the logic of the tesseract, it’s a world that also exists in tandem, a parallel universe to the world we currently inhabit. And it is this simultaneity that offers a sense of comfort. In the film, as in the live dance component, Atlas, Mitchell and Riener are able to expound upon the balance of the body and technology, without sacrificing the humanness of dance. Tesseract ▢ opens with the body, and more importantly, with human touch. The camera pans out on the face of Melissa Toogood, a stunning mover (who had also danced with the Merce Cunningham Dance Company with Mitchell and Riener). 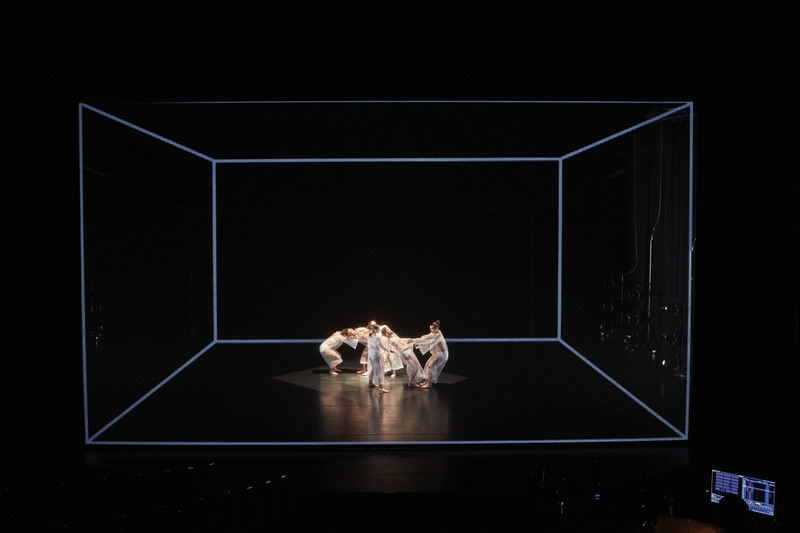 Toogood’s eyes are set within black squares of makeup, similar to those juxtaposed on her and the other five dancers’ costumes. Hands appear, stroking her face, caressing. There is a care here, even though a context, or a relationship, isn’t offered. The connection between the dancers through this sequence (as the choreography builds in energy, the camera framing and re-framing groups or solos between and black and white painted panels) creates a somehow comfortingly human world—can the future be that scary when painting is still involved? The flattened rectangle takes form in another scene, which may be the key sequence of Tesseract ▢. The six dancers recline against a mirage-like desert or moonscape in which a futuristic city shines in the distance. Each dancer is paired with an orange three-dimensional object—a cube, a cone, a sphere—to which he or she is uniquely wedded. Geometric protrusions on the dancer’s unitards almost suggest objects and bodies to be one of the same species. Despite the oddity, there’s a sense of care here too, a pervading calm, a humanity even as the dancers’ bodies appear more and more like the shapes with which they are paired. It’s a visual of Jean- François Lyotard’s “collection of materials” as the definition of humanity, but one where once collected, the assemblage has been pared down, reduced, leaving a kind of unknown essence. It’s this form of utopia that Tesseract offers, one where bodies can take on the auspices of other objects or species. The film culminates in a sensual pas de deux, a courtship dance of strange birds-of-paradise. 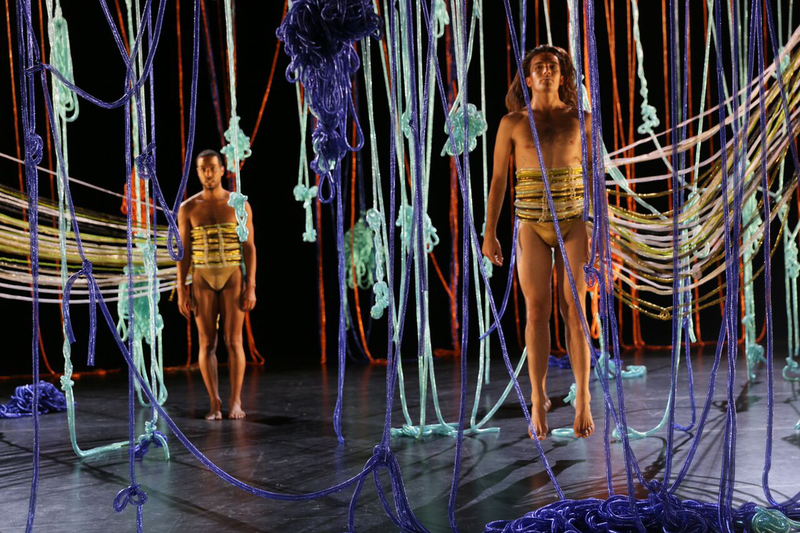 Mitchell and Riener, half clothed in the rope-like décor that surrounds them, demonstrate their individually unique yet compatible movement styles: Mitchell’s preciseness, exuding a quiet strength, and Riener’s beguiling and fiery movements, supported by a technique that maintains its strength even as both fall into playful exchanges with each other and with the viewers. It’s this technique allows an experience of witnessing a private moment between two beings, not men, not dancers. The portal through which we are gazing, the fourth dimension of the tesseract, lets us into a world not yet realized and only beginning to be actively sought within our own. A fourth dimension removes the possibilities of binaries, creating a space for bodies to exist outside of gender. Tesseract is this utopian world, one that equalizes without essentializing. Tesseract ◯, or the live performance and video second act, follows the logic of the geometrical form, adding yet another dimension to the work. The dancers enter in a square formation lead by Mitchell, pausing at each corner of the stage, sharply changing direction and running to the next corner. Down to the gauzy white flared pant suits (which also share a kinship with Suzanne Gallo’s kimonos for Cunningham’s BIPED ), it’s a futuristic version of Trisha Brown’s Glacial Decoy (1979). The choreography again balances between stark and formally playful. Where there isn’t eye contact there’s touch, a closeness that seems innate with dancers who have worked and trained closely together for extended periods of time, a calmness in knowing where everyone else on stage is (and why) at any given time. The silent observer to this play is Ryan Jenkins, Senior Video Technician at EMPAC. Costumed in a bright pink jumpsuit and glittering silver shoes, Jenkins embodies the camera, quite literally becoming another body within the choreography. Even his donning of the rather awkward and seemingly heavy Stedicam occurs center stage with the assistance of technical producer Davison Scandrett, a reveal of the façade, a fourth wall (or fifth wall) moment. After establishing the structure of the dance, and ensuring us that the world that existed within the frame of Tesseract ▢ can exist here, mediated only by a barley visible scrim, the action folds out onto itself again, with Mitchell guiding Jenkins, the human-apparatus onstage. Jenkin’s movements are from here out choreographed, while the video footage he captures live is mixed by Atlas in real time and projected onto the scrim downstage of the dancers. Even when Jenkins is off stage, hidden cameras offer alternate views of the movement on stage including close-ups and aerial shots. In Tesseract ◯, the artists picked up Cunningham’s oft-repeated adage of “there are no fixed points in space,” a key structure to his work from Suite for Five (1956) to Ocean (1994). For Cunningham, this exploration of “space time” is arguably his trademark as a choreographer; even more than using chance to construct his work, his use of the stage (and non-stage) space—the temporal structure through heightened moments of stillness and silence—is arguably his most lasting impact on choreographers working today. Atlas, Mitchell, and Riener’s live performance gives form to Einstein’s concept of “space time” or (x, y, z, t). Time—the real-time aspect occupied by all live performance and underscored by Atlas’ live video mixing—is added to the structure established in the film. Where the dancer’s relationships to the objects in the film was firmly established, Tesseract took up this approach by constantly provoking a viewing of the dancers as objects that will be seen from different vantage points. The dancers themselves are the geometric forms, turned, and observed from different angles. There’s more to unpack in Tesseract. There’s a moment near the end of the live performance when Eleanor Hullihan crosses the scrim, inches away from the front rows. Mitchell remains on the stage, unwilling to let her remain on “our side.” There’s a vulnerability in Hullihan here and when, after a few moments she recedes to the wings and then back to the downstage side of the scrim, there’s a collective relief that she’s found her way back. Atlas, Mitchell, and Riener have offered a view of a future, and it’s one that I’m looking forward to realizing, living in, and finding refuge in.